Many people who are newcomers to Spanish tend to confuse the words me and mi. This is highly understandable, as the spellings are very similar and both refer to the one who is speaking. To native speakers or long-time users of Spanish, however, the two words have rather different spellings and meanings. This article will describe the many differences between me and mi. Calvin: I read this book from the library. Mom: What do you think about it? Calvin: To be honest, it made me see things differently. It gave me a lot to think about. Mom: I’m glad you’re enjoying it. Calvin: It complicated my life. Don’t bring me to the library anymore. Calvin: How long do you need to be ready? Hobbes: At least 15 minutes, plus drying time. Calvin: I’m bored. I don’t have anything to do. Mom: You have all the outdoors to play in! If you can’t find anything to do, you haven’t tried at all. C’mon! Use your imagination! 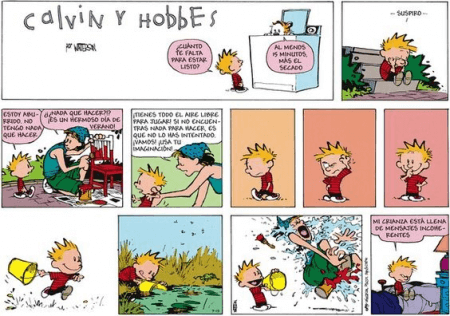 Calvin (after splashing his mother with water): My childhood is full of mixed messages. What is the difference between me and mi in Spanish? While they both refer to the speaker, they are used in very different contexts. Me is usually found before a verb or as a conjunction to it; for example, Me gusta comer helado. (“I like to eat ice cream.”) In the previous sentence, the pronoun me comes before the verb gusta. In contrast, mi usually goes before a noun or another pronoun. For example, El helado es mi postre favorito. (“Ice cream is my favorite dessert.”) In the previous sentence, the pronoun mi comes before the noun postre. Me usually implies that the speaker is either the doer of a certain action or is affected by it. Mi, on the other hand, indicates that the speaker owns or possesses a certain item. Me in Spanish and me in English are closely identical in meaning. Mi, however, is the closest Spanish equivalent to the English my.